I start blogging @ SPYMAC. Treating here as my digital diary, mainly for photos and snapshots, since I write online diary at other website for years. I use my SONY CLIE PEG-TH55 for snapshot. For a-bit-serious photo, I use SONY Cybershot DSC-F505V. 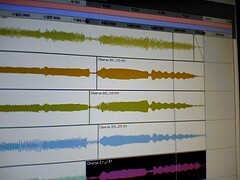 My first blog, introducing my job: recording engineer, and the art of singing: pulse (illustrated in ProTools session screen).